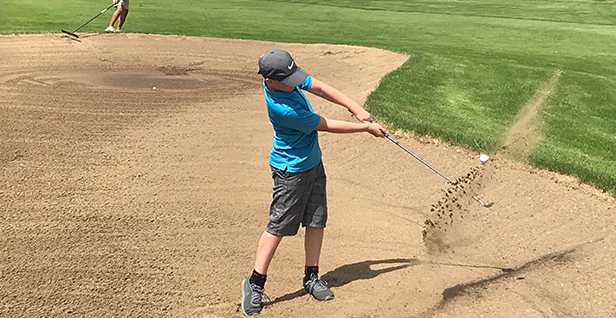 Cedar Falls, Iowa – The first round of the Cedar Valley Junior Championship presented by Community Motors took place on June 28 at the Pheasant Ridge Golf Course. The final round begins at 8:00 a.m. tomorrow morning. Click here for round two pairings. Tyler Vaske of Knoxville, Iowa leads the boys 16-18 division after the first round. Vaske carded a bogey-free front nine with one birdie. He then added four more birdies on the back nine to finish round one with a 4-under-par 68, and a five-stroke lead. Dylan Ellis is in second place after round one. Ellis finished the first round with a 1-over-par 73. His round was highlighted by four birdies, including three-in-a-row on Nos. 2-4. Paige Hoffman of West Des Moines, Iowa leads the girls 16-18 age division after round one. Hoffman carded one birdie on the front nine and poured in nine straight pars on the back nine to finish round one with a 2-over-par 74. Matthew Briggs of Burlington, Iowa sits atop the boys 14-15 leaderboard. Briggs tallied two birdies, and eagled the par-5 8th hole on his way to a 1-under-par 71. He currently holds a one stroke lead over Jack Dumas. Dumas’ first round featured one birdie and a bogey-free back nine for a round one total of even-par 72. Saffire Sayre and Rylee Heryford are tied for first in the girls 14-15 age division. Sayre tallied three birdies on the front nine and one on the back nine, while Heryford registered two birdies on the back nine. The two finished round one at 5-over-par 77. Maxwell Tjoa holds a two-stroke lead in the boys 12-13 age division after day one. Tjoa carded three birdies on the front nine, including two-in-a-row on Nos. 3-4. He added his fourth birdie of the round on the par-3 16th hole to shoot a 1-over-par 73. Owen Sawyer will start the second round two-stokes behind Tjoa. Sawyer notched two birdies in his opening round, and finished with a 3-over-par 75. Hallie Yates holds a five-stroke lead entering the final round. Yates’ round was highlighted by a birdie on the par-4 7th hole. She finished her 9-hole round with a 2-over-par 38. Maura Peters also recorded one birdie in her first round. Peters birdied the par-4 9th hole to shoot a 7-over-par 43. Vaughn Roseman and Pranay Monga are tied for first place in the boys 11 & under age division. Roseman and Monga each carded a 10-over-par 46 in their 9-hole round today. C.T. Norris is just one stroke behind the leaders, after finishing round one with an 11-over-par 47. The final round of the Cedar Valley Junior Tour Championship presented by Community Motors takes place tomorrow at 8:00 a.m. at the Pheasant Ridge Golf Course. The Cedar Valley Pee Wee Tour Championship will take place tomorrow at the Walters Ridge Golf Course, as well as the Iowa PGA’s second Drive, Chip and Putt local qualifier. There is expected to be over 150 junior golfers at Pheasant Ridge tomorrow! Updates on each event will provided on the iowapgajuniorgolf.com website, and the Iowa PGA social media pages.